In this study, the occurrence, seasonal, and spatial variations of four classes antibiotics were investigated in the surface water of North China. Water samples were taken from 24 sampling sites along rivers in May and August and antibiotics in water samples were detected by SPE-UPLC-MS/MS. The occurrence of all antibiotics except for FLO in May were higher than in August. The mean concentrations of four classes antibiotics detected in May and August were in the following order respectively: quinolones (421.23 ng/L) > tetracyclines (28.37 ng/L) > amphenicols (20.38 ng/L) > sulfonamides (5.79 ng/L) and amphenicols (284.36 ng/L) > quinolones (15.74 ng/L) > tetracyclines (3.05 ng/L) > sulfonamides (0.20 ng/L). The results showed that quinolones and amphenicols were dominant antibiotics among four classes antibiotics. To explore the source of antibiotics from the fish ponds nearby, antibiotic concentration data, which was investigated in the sediment, fish feed and fish revealed a direct relationship between the main antibiotics and fish farms along the rivers. 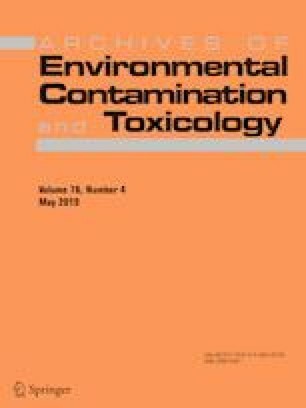 Risk assessment data indicated enrofloxacin and florfenicol could cause higher safety risks to aquatic organisms compared to other antibiotics. The online version of this article ( https://doi.org/10.1007/s00244-019-00605-0) contains supplementary material, which is available to authorized users. This work was funded by the Fundamental Research Funds for the Central Universities (ZZ1706). The author thanks the Beijing Municipal Environmental Monitoring Center for its help in collecting water samples.